Despite being an age-old practice, some might say that breastfeeding doesn’t always come naturally for every mother. Moms could benefit from hearing first-hand, personal experiences and advice from a trained breastfeeding peer counselor. She may need to meet with a lactation consultant to help her baby latch. For others, being able to call a help hotline from home would be helpful and add a measure of security. When you think of breastfeeding support services like these, does the WIC Program come to mind? For the 40th anniversary of WIC, we’re promoting the primary pillars of WIC services—one of which is the often overlooked breastfeeding support and promotion that WIC staff provide to moms. We’ve created short online video clips to showcase WIC’s breastfeeding services, and we encourage you to share the word during National Breastfeeding Month in August. With positive voices sharing our message throughout the digital space, and an updated USDA Loving Support Makes Breastfeeding Work campaign on the horizon, we are excited for perceptions to improve and for WIC’s breastfeeding promotion to get the credit it deserves. How Does WIC Promote Breastfeeding? WIC promotes breastfeeding as the optimal infant feeding choice and supports moms along the way. WIC staff educate pregnant women on the benefits of breastfeeding and help them plan to breastfeed. Once mom starts breastfeeding, she can turn to WIC for encouragement, to help answer her questions, and in some states she can reach out to a help hotline from home. 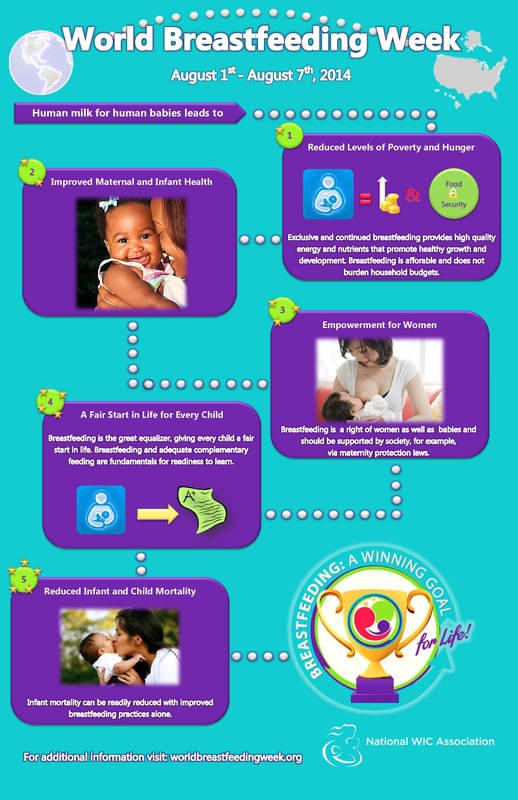 See our infographic on How WIC Supports Breastfeeding. Help us bring awareness to WIC’s breastfeeding support services by sharing our materials! Share our infographic about the benefits of human milk. The National WIC Association’s theme for WIC's 40th Anniversary—WIC: Strengthening Families for 40 Years—showcases how the WIC Program is one of our country’s most important public health programs, and has enriched the lives of millions of families since its founding. Help us celebrate four decades of WIC successes! Check out WICturns40.org for shareable anniversary materials, resources, and a calendar of events. Questions? Email Samantha Lee at slee@nwica.org. WIC serves nearly 9 million low-income mothers and young children monthly, including 53% of all infants born in the U.S. Since the program’s inception in 1974, WIC’s services have consistently and successfully improved health outcomes in the population it serves.